South Africans young and old have spent the last several days figuring out what Mandela meant to them personally. But many feel they also need to figure out their path forward. She only knows him from the history books at her school in Johannesburg. 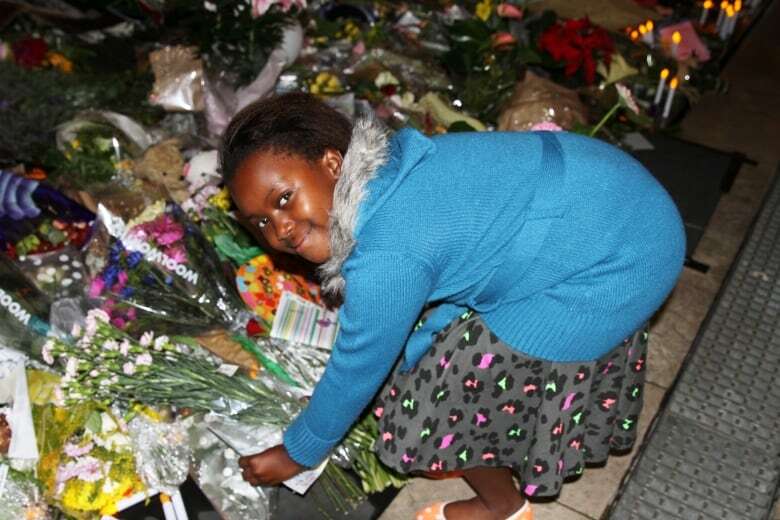 But nine-year-old TshifhiwaNemutshili is certain that Nelson Mandela was a great man. “He lived a long time and we’re honoured to live in his history,” she told me, as she clutched a homemade card she made with crayons and stickers. “R.I.P. Madiba,” Tshifhiwa wrote, a term of respect referring to his clan name. She has learned another lesson, beyond school, too. South Africans young and old have spent the last several days figuring out what Mandela meant to them personally. The tributes still pour in — South Africa’s President Jacob Zuma said Sunday Mandela was “a light in the darkness” — but as dozens of world leaders make their way here for memorial services, many South Africans are moving beyond the history books and accolades. “This is our time to remember Madiba,” said Elaine Philip. She, like tens of thousands of others, brought her children down to Nelson Mandela Square in Johannesburg. People wait patiently to have their pictures taken with a towering statue of the former South African president. Children bend down to lay wreaths of flowers and homemade goodbye messages. What continues to take place at churches, squares and public spaces is nothing like a vigil. South Africans are praising the life of their beloved Madiba. “Yes, of course we are sad. But it’s like when your grandfather passes away, we celebrate their life work and we smile and we dance. We do this for him even more,” Celina Makoba told me as she clapped her hands to the traditional music that has transformed the street in front of Mandela’s home into a festival. Men and women in red and green traditional tribal costumes chant and dance as a small parade makes its way in front of the home. The music infects everyone and soon there are few hands that aren’t clapping. This scene plays out into the early hours of the morning. Many people have come here every day since it was announced Mandela died, last Thursday. But there has also been time for sober reflection, as well. “We’re in a bad spot at the moment but we need to remember him every day of our lives,” said John Davis, who came to pay his respects at Mandela Square. Davis used to live in Cape Town, in an apartment overlooking the prison where Mandela served 27 years behind bars. But he did. And Davis thinks that after Mandela is laid to rest, South Africans need to figure out their path forward. Derek Stoffel, CBC's World News Editor, is a former Middle East correspondent, who covered the Arab Spring uprisings in Tunisia, Egypt and Libya and reported from Syria during the ongoing civil war. Based in Jerusalem for many years, he covered the Israeli and Palestinian conflict. He has also worked throughout Europe and the U.S., and reported on Canada's military mission in Afghanistan.